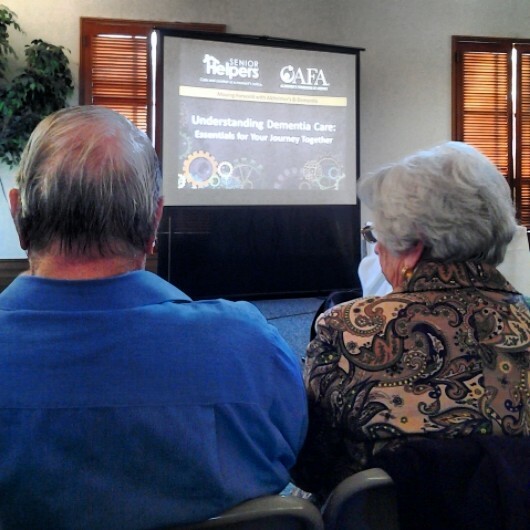 Last night I went to an Understanding Dementia Care seminar with my Grandpa, because, you know, we're sort of living this whole thing out, and I was blown away by the information they shared. The human brain is incredible. Anyway, what I learned is not what I want to talk about. I want to talk about these two people in the picture. I tweeted this picture right when we sat down, before anything had started. Before Ollie turned around and introduced himself to my Grandpa and me (who was trying to convince people I was his wife... same last name on our name tags... get it?). Nothing in our conversation with him was out of the ordinary. His wife smiled and contributed a few comments to the conversation but it was over quickly. Then the presentation started. When the presenter said that dementia is a terminal disease and people diagnosed with it can only be expected to live 8-12 more years, Ollie's wife leaned over and whispered in his ear, and Ollie put his around around her and began to rub her back and stoke her hair. His arm stayed there for the majority of the two hours. I couldn't look at them because whenever I did, my heart melted and eyes filled up with tears. I can't imagine losing a spouse in the way that Ollie is, in the way my Grandpa is, and to know that there is no getting better. It will only get worse. It's heartbreaking to watch this completely self-sacrificial love but I've been fortunate enough to see it many times before.